On the 8th day of Christmas, EARMILK gave to thee, A CODES mix that is incredibly bouncy! 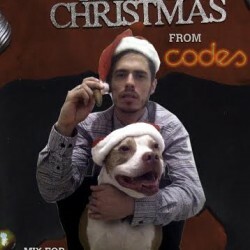 Bringing in the 8th day of Christmas, CODES, has given us a mix to start our week off right. CODES is known for being classic, so santa's elves picked a classic beverage for this mix. This mix is light & spicy, so naturally the perfect drink is the Tom & Jerry. A Tom & Jerry, is similar to eggnog, but a much sassier rendition. Tom & Jerry is a sweet & spicy egg batter mixed with hot water and rum, brandy, or whiskey. A funky touch on a christmas classic, just like CODES mix today. CODES sat down with his pup Josie & Santa to sip some Tom & Jerry and talk about holiday tradition, and the future for Brooklyn's coolest DJ. SANTA: Have you been naughty or nice this year? S: What rooms would you add to your ginger bread house? S: Who do you want to be caught under the mistle toe with? S: Screw, Marry, Kill: Rudolph, Vixen, Dasher? C: Umm well this curve ball has no way to go but dark… I guess I would feed them bath salts so they could all get married then, screw and kill each other. S: What's on your Holiday list? C: Mele Kalikimaka by Bring Crosby because of watching National Lampoons Christmas Vacation every Christmas and the pool scene was my favorite part. S: What are you grateful for in 2013? S: What do you look forward to in 2014? S: Are you making any New Years resolutions? S: Where will you be when the clock strikes midnight?